Add the dried mushrooms to a small bowl and cover with very hot water; let sit for 15 minutes, then drain and finely chop. In a large bowl, mash the bread and milk together until a smooth paste forms. Gently knead in the beef, salt, and pepper, and mix well. Add the butter to a medium-size, heavy saucepan and heat over medium-high heat. When melted, add the pancetta and sauté until browned, about 8 minutes. Pour off all but about 2 Tbs. of the fat. Add the meat mixture, and cook until browned, about 10 minutes. Add the fresh porcini and cook until softened, about 2 minutes. Stir in the dried mushrooms, carrots, celery, onions, garlic, and nutmeg. Sauté until the vegetables are slightly softened and aromatic, about 3 minutes. Add the tomato paste and flour, and cook until the flour is no longer visible, no more than 1 minute. With the pan off the heat, carefully add the wine. Then return the pan to high heat and stir well, scraping the bottom of the pan with a wooden spoon to release any food bits. Cook for 2 minutes, then stir in the tomatoes and stock, and cook for another minute. Pour into the slow cooker. Cover the slow cooker and cook on low until the meat has cooked through and the sauce is aromatic and very flavorful, about 6 hours. Spoon the fat off the surface, stir in the rosemary, break up the meat more with a fork, and serve with pasta. 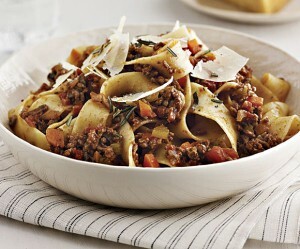 Pappardelle Pasta are large, very broad, flat pasta noodles, similar to wide fettuccine.. The fresh types are two to three centimeters (¾-1 inch) wide and may have fluted edges. Dried egg pappardelle have straight sides.